By which of course I mean that we’ve now survived 100 days and nights of this ‘lunatic adventure’, as one of our more respectable friends called it. 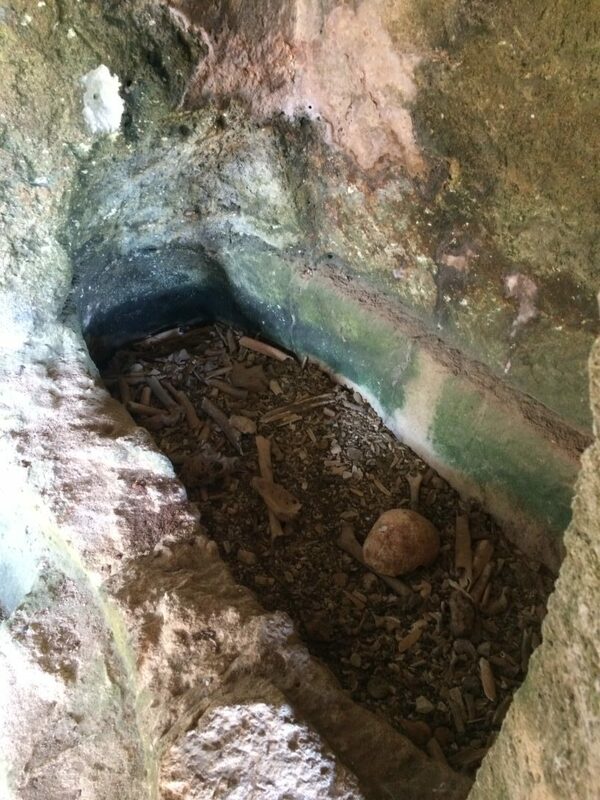 No harsh words, no knife-fighting and even the dog has maintained an even keel, despite the attentions of random feral dogs, stray cats and vagrant tortoises. Well done all of us. What have we learned from this, then? Hmmmm… well, we think that we place quite a high value on being part of a small community in the UK, for one thing. No matter how welcome the locals have made us feel in our various stopping places, we’ve been keenly aware that the language, culture, history, shared experiences – all the stuff that you might call the small change of life – is in a different currency from the one we feel most comfortable with. Not that we don’t enjoy it, mind, it’s just that we wouldn’t want to settle down with it for ever. We’ve also concluded that we both very much enjoy encountering new experiences and overcoming unforeseen challenges. Call us shallow novelty-seekers if you like, but for us too much dull routine and the same old, same old can get boring after a while. This might contradict the first finding above, but in a place like Hay the unforeseen tends to rear its attractively squamous head more often than you might think. 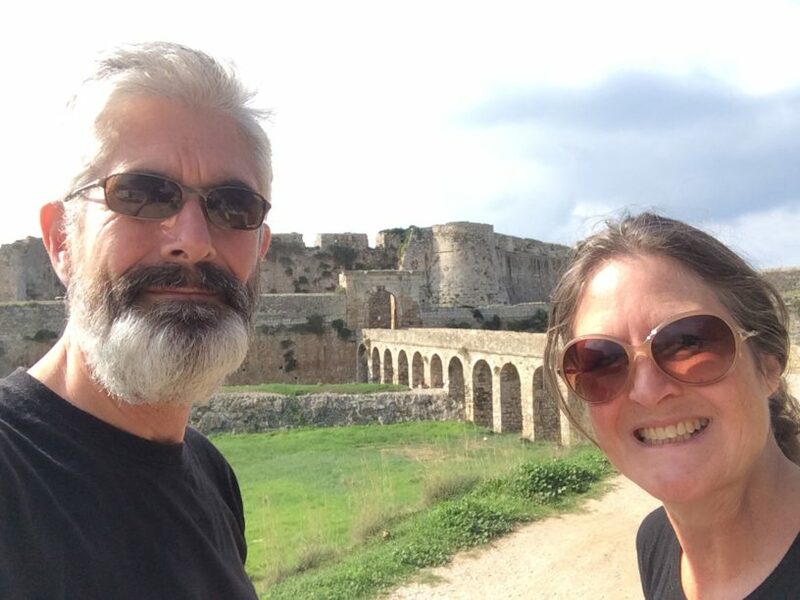 No apologies for using ‘squamous’ by the way – we came across it the other day on one of those boards that Greece’s Commissioners of Ancient Monuments put in place to educate and inform visitors to old castles and such like. It’s a word that deserves to get out and about more. Seventeen countries and 9,000 miles over the past 100 days have also convinced us that this sort of extended trip is utterly enjoyable and well worth doing – for us, at any rate. Stand by for more in the New Year. Back to less conceptual issues, and we found to our surprise that we’d spent a week at the last campsite; the first time we’d been so still for so long since we’d left the UK. Clearly it was time we moved again, but this time we only wanted to shift to another position some 10km along the coast. 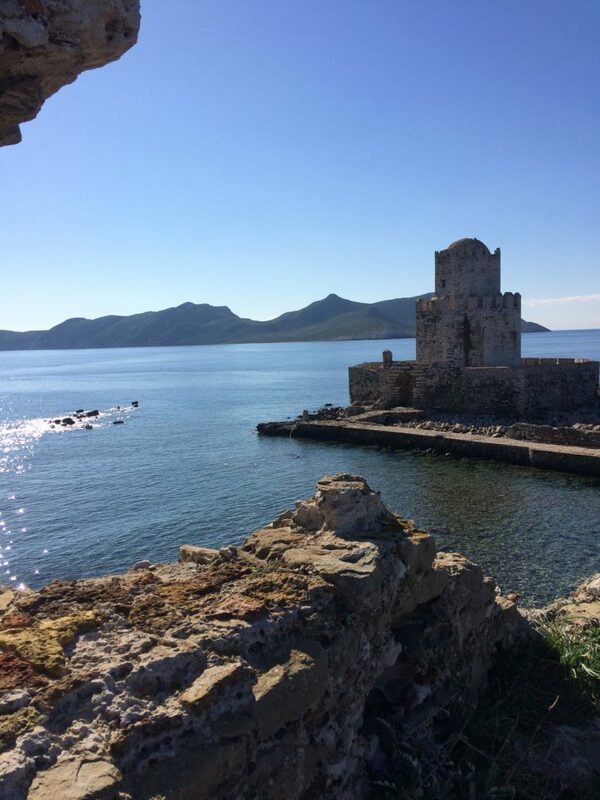 Having cycled there a couple of days before we had been very taken by the small town of Methoni – it had a couple of cafe- and taverna-lined squares, some pleasingly idiosyncratic shops and a sprawling old Venetian fort from the 1400’s or thereabouts. So we started up the van, chucked in some more diesel on the way and hauled on the handbrake in a car park just around the corner from the more picturesque of the two squares and right next to the sea. 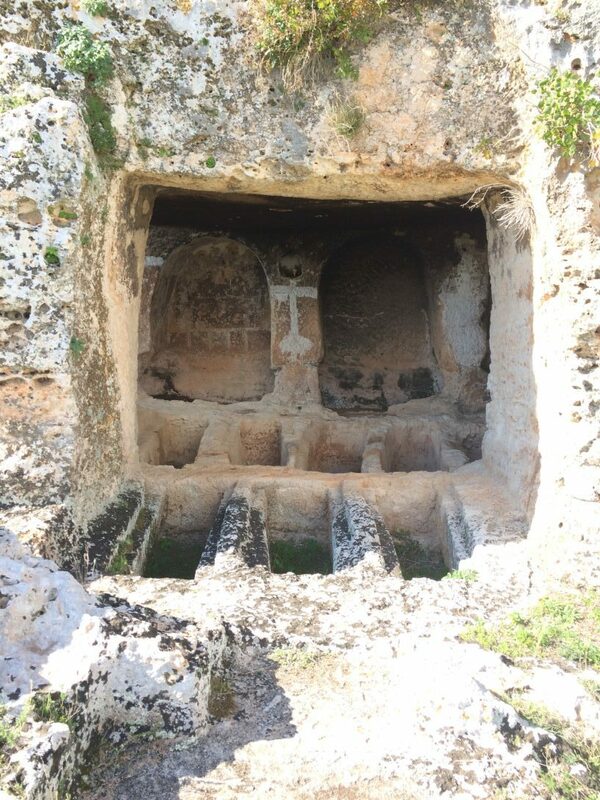 The burial pits inside the catacombs were jammed in cheek by jowl – this had clearly been a well-used place in the past. 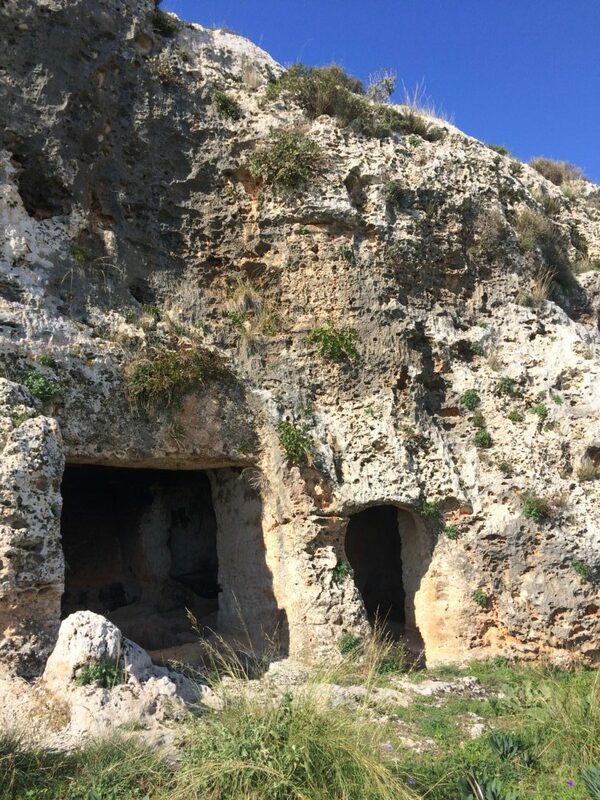 …but it turned out that the catacombs were combined with a former monastery – feeling slightly like trespassers, we left well alone and headed back down the hill to the van, and the road to Sparta (although for technical reasons we were going to stop about 5 km short of the town iteslf). The trip turned out to be a bit longer than we’d expected, but asking ourselves, “What would the Spartans have done?” led us to conclude that they’d have driven on into the night in order to reach their destination. So that was what we did, for about 45 minutes, that being the time between the sun disappearing below the horizon and us appearing in that evening’s car park. 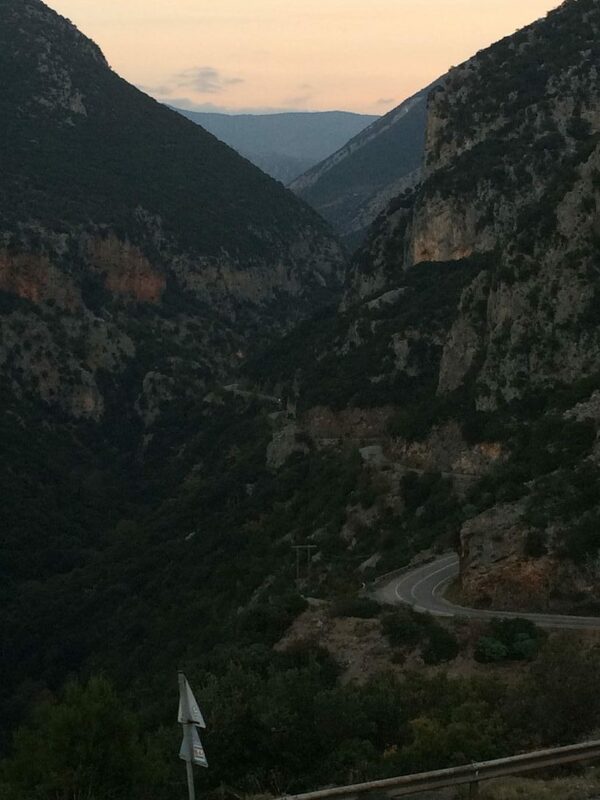 The journey through the darkness took us across what felt like a significant mountain pass, with the climb and descent both characterised by what seemed like endless successions of hairpin bends. 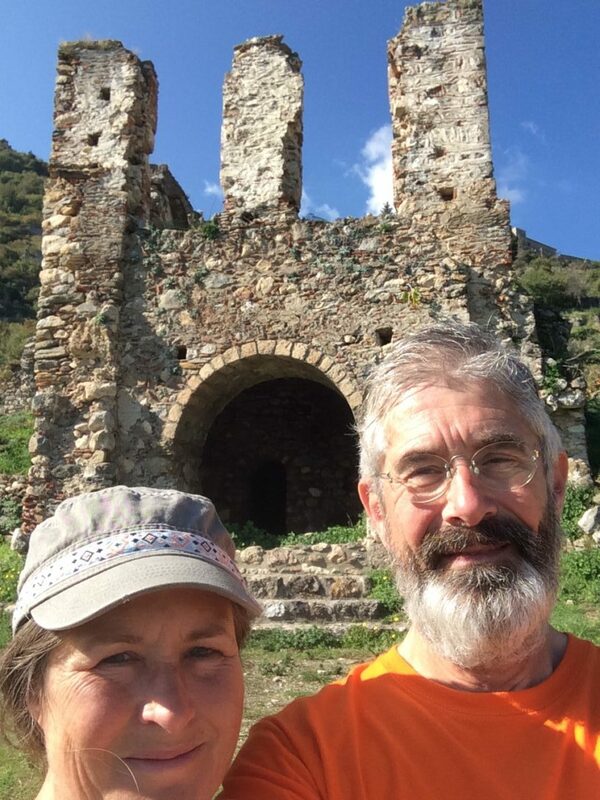 Next morning’s internet consultation revealed that we had groped our way blindly along what the Lonely Planet Guide to Greece described as, “one of the most stunning, if time consuming and winding routes in Greece”. Blast. That’s the last time I seek the notional advice of the Spartans then – joyless bunch of self-deniers. 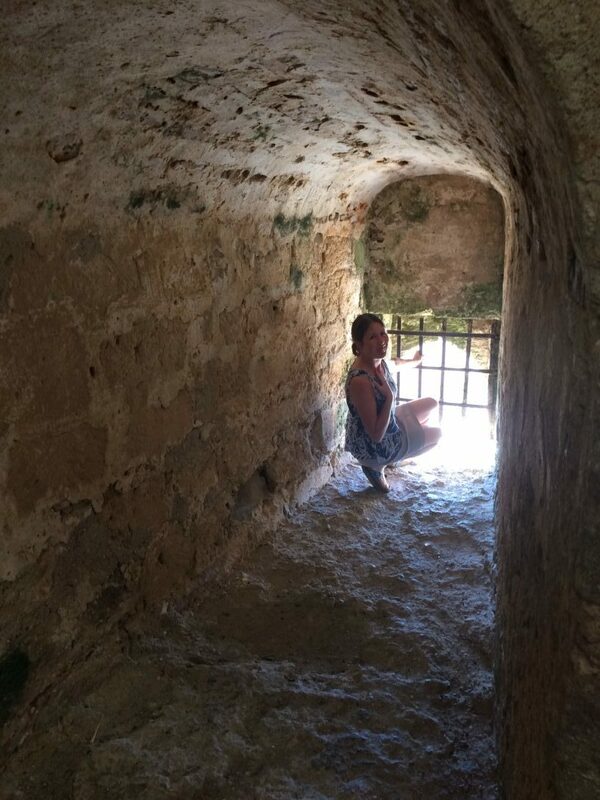 Turning our back on Sparta, we headed for the UNESCO World Heritage Site at Mystras – a huge and long abandoned fortified town with a palace, several churches and any number of twisting stone lanes up, down and around the place. 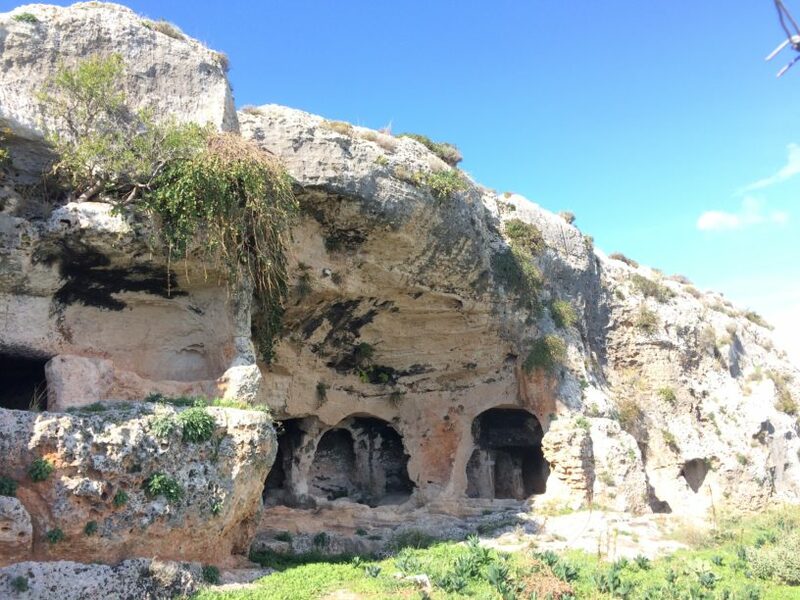 At one time it played a major part in the Byzantine empire but the years hadn’t been kind to it and it was largely in ruins by the time we arrived. Some of this might be down to the Gift Shop’s unusual approach to turning a profit; for anything between 50 and 200 Euros you could walk away with a certified Greek antiquity from the site. Small votive figurines were to be had for a song; sizeable fragments of marble doorposts, beautifully carved, were available at the upper end of the price bracket. No wonder there wasn’t much left of the place, we thought, leaving the shop’s stock in trade where it was. Perhaps this aspect of the tourist trade might offer an explanation for how Britain came to possess the Elgin Marbles. And with that profound observation we turned our faces to the seaside again for some more R&R and showers all round.